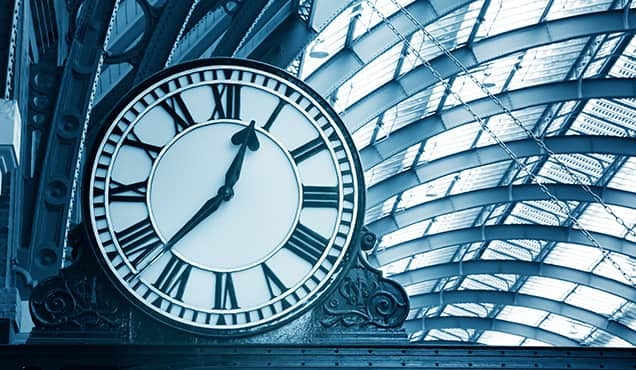 With global equity markets selling off under threats of a trade war – combined with newly exposed risks in the tech sector – it’s no surprise that investors have started to reduce exposure to US equity-focused ETFs. In Q1 2018, we saw the first quarterly outflows from this asset class since 2016, though the net outflow of $151m is not significant compared with the $88bn in Q4 inflows. 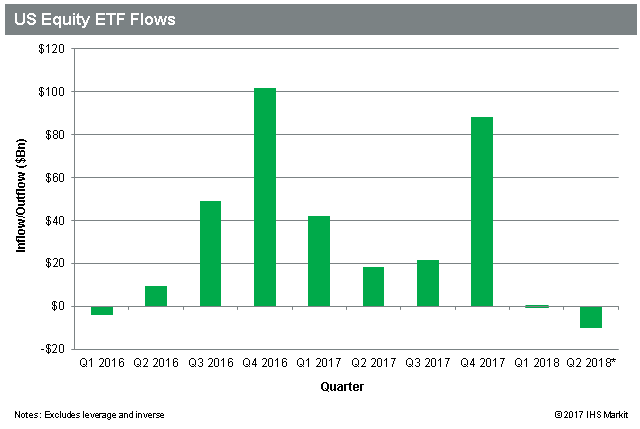 So far in Q2, the outflow trend has continued, but with the quarter being one week old that could easily reverse if the market is able to find its footing. Investors on the long side weren’t the only ones selling: short sellers raised their bets against US equities, with balances increasing by $11bn or 2bps of total US equity market cap. 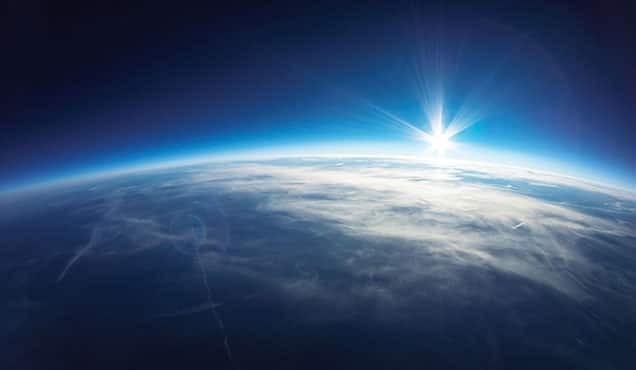 This furthers a trend of increasing short demand, which started in late January 2017. It’s worth noting however that the increase in short balances is smaller than was seen in Q1 2016, when short balances increased by $42bn or 9bps of total market cap. 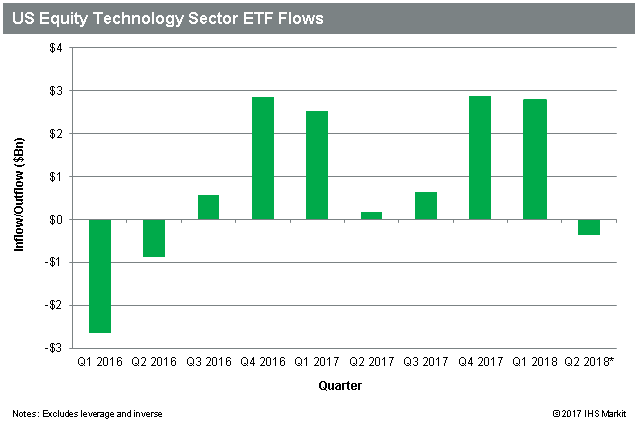 One sector ETF investors did not shy away from in Q1 was Technology sector focused funds, which saw a 2nd consecutive quarter of greater than $2.5bn of inflows. 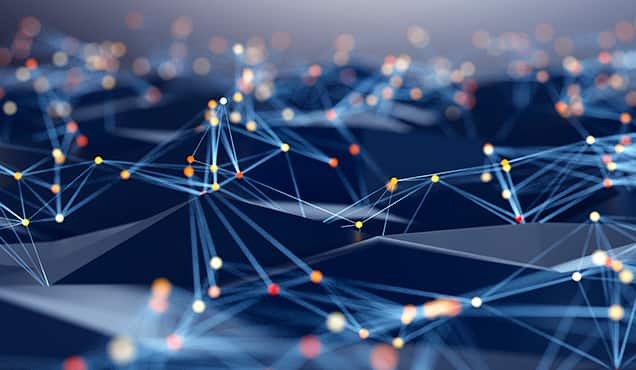 The opening days of Q2 have seen $350m in outflows, suggesting investors may be starting to rotate away from the sector. 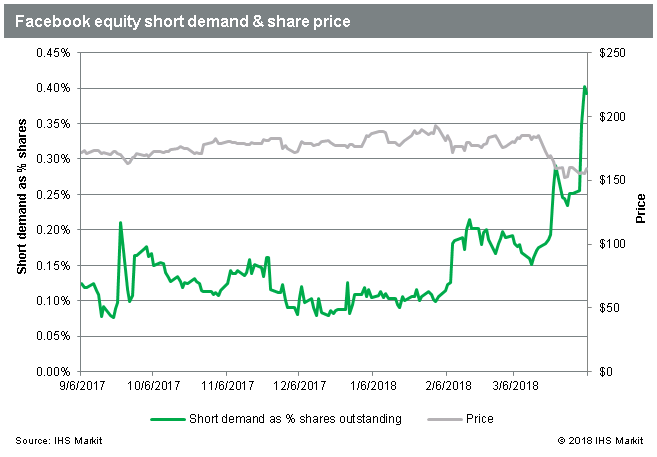 Short sellers have been taking action in the Technology sector as well, recently increasing bets against Facebook and Oracle, among others. 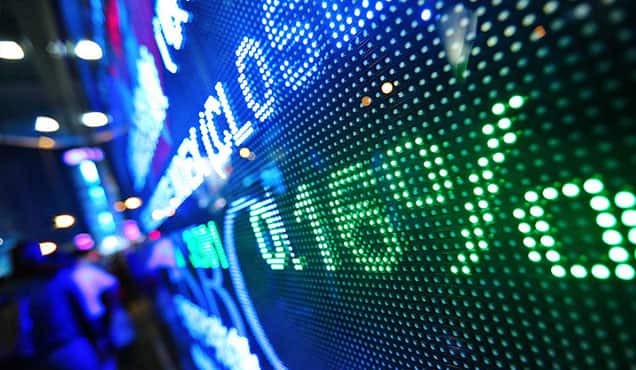 The issues faced by Facebook over privacy concerns and the related sell-off have attracted short sellers to pile in. 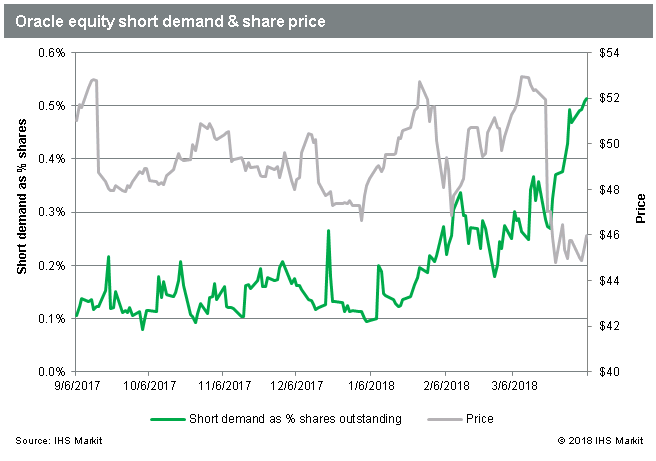 Since the last exchange short interest was collected for settlement on March 15th, we’ve seen a further 7m shares go on loan. 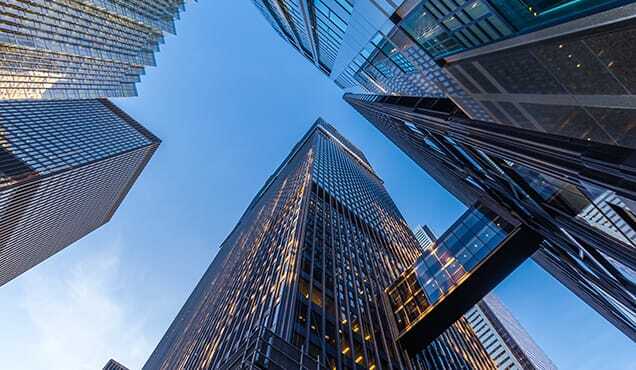 We expect that the next exchange number will print higher, but it’s also possible some of the increased borrow is to replace shares which had originally been sourced from hedge fund long positions that are being sold. Either way, hedge funds have been sellers of FB. After reporting lower than expected revenue and weaker guidance, shares of Oracle traded down as much as 8% and have yet to recover the losses. 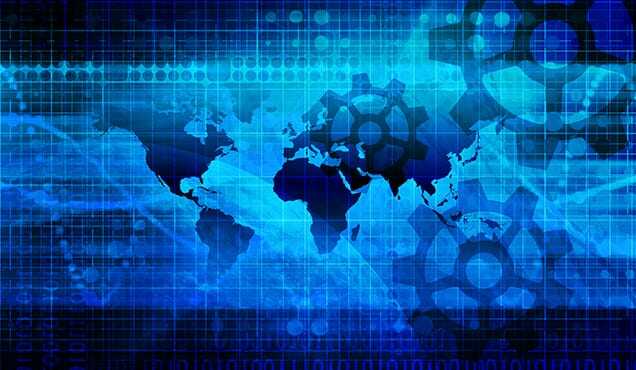 We therefore expect the next exchange SI number will print higher, as the increase in short demand occurred after the last exchange number was collected. 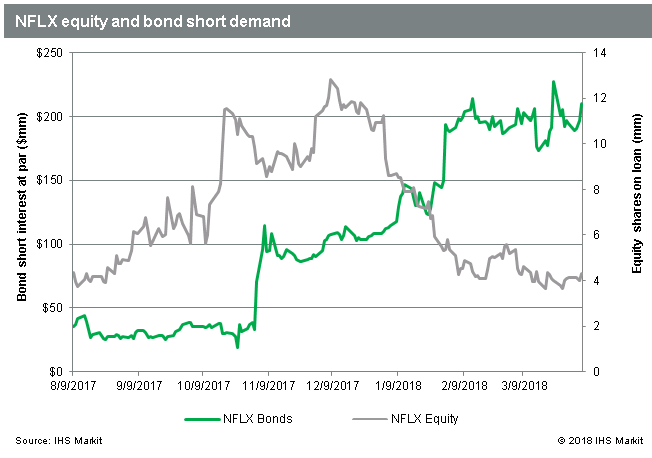 NFLX is another tech stock with recent activity on the short side, though interestingly, the equity and bonds are telling a different story with short demand for the bonds increasing, while equity shorts have retreated. 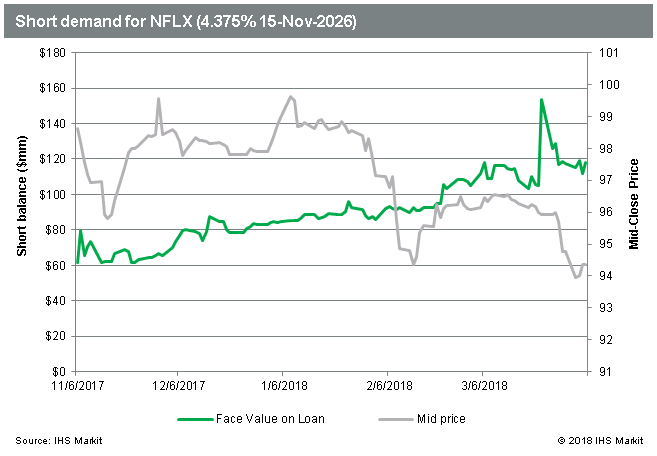 That change in approach for short sellers has been right on the money, with equity shares still up more than 40% YTD, while the most shorted bond, the NFLX 4.375% 2026 issue, hit a new low on April 2nd, below 94 cents on the dollar (5.6%).